In the early 21st century, baobabs in southern Africa began to die off rapidly from a cause yet to be determined. Scientists believe it is unlikely that disease or pests were able to kill many trees so rapidly, while some speculated that the die-off was a result of dehydration from global warming. Adansonia trees produce faint growth rings, probably annually, but they are not reliable for aging specimens, because they are difficult to count and may fade away as the wood ages. Radiocarbon dating has provided data on a few individuals of A. digitata. The Panke baobab in Zimbabwe was some 2,450 years old when it died in 2011, making it the oldest angiosperm ever documented, and two other trees — Dorslandboom in Namibia and Glencoe in South Africa — were estimated to be approximately 2,000 years old. Another specimen known as Grootboom was dated and found to be at least 1275 years old. Greenhouse gases, climate change, and global warming appear to be factors reducing baobab longevity. Of the nine species accepted as of April 2018[update], six are native to Madagascar, two are native to mainland Africa and the Arabian Peninsula, and one is native to Australia. One of the mainland African species also occurs on Madagascar, but it is not a native of that island. It was introduced in ancient times to south Asia and during the colonial era to the Caribbean. It is also present in the island nation of Cape Verde. The ninth species was described in 2012, and is found in upland populations of southern and eastern Africa. The African and Australian baobabs are almost identical despite having separated more than 100 million years ago, probably by oceanic dispersal. The Malagasy species are important components of the Madagascar dry deciduous forests. Within that biome, Adansonia madagascariensis and A. rubrostipa occur specifically in the Anjajavy Forest, sometimes growing out of the tsingy limestone itself. A. digitata has been called "a defining icon of African bushland". Baobabs store water in the trunk (up to 120,000 litres or 32,000 US gallons) to endure harsh drought conditions. All occur in seasonally arid areas, and are deciduous, shedding their leaves during the dry season. Across Africa, the oldest and largest baobabs began to die in the early 21st century, likely from a combination of drought and rising temperatures. The trees appear to become parched, then become dehydrated and unable to support their massive trunks. Baobabs are important as nest sites for birds, in particular the mottled spinetail and four species of weaver. 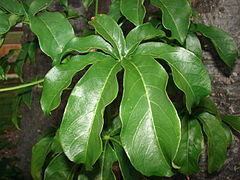 Leaves may be eaten as a leaf vegetable. The fruit has a velvety shell and is about the size of a coconut, weighing about 1.5 kilograms (3.3 lb), but is not as globular. The fresh fruit is said to taste like sorbet. It has an acidic, tart, citrus flavor. It is a good source of vitamin C, potassium, carbohydrates, and phosphorus. The dried fruit powder of Adansonia digitata, baobab powder, contains about 12% water and modest levels of various nutrients, including carbohydrates, riboflavin, calcium, magnesium, potassium, iron, and phytosterols, with low levels of protein and fats. Vitamin C content, described as variable in different samples, was in a range of 74 to 163 milligrams (1.14 to 2.52 gr) per 100 grams (3.5 oz) of dried powder. In Zimbabwe, the fruit is used in traditional food preparations which include "eating the fruit fresh or crushed crumbly pulp to stir into porridge and drinks". In the European Union (EU), prior to commercial approval, baobab fruit powder was not available for use as a food ingredient, as legislation from 1997 dictated that foods not commonly consumed in the EU would have to be formally approved first. In 2008, baobab dried fruit pulp was authorized in the EU as a safe food ingredient, and later in the year was granted GRAS (generally recognized as safe) status in the United States. The fruit pulp and seeds of A. grandidieri and A. za are eaten fresh. In Tanzania, the dry pulp of A. digitata is added to sugarcane to aid fermentation in brewing (beermaking). Some baobab species are sources of fiber, dye, and fuel. Indigenous Australians used the native species A. gregorii for several products, making string from the root fibers and decorative crafts from the fruits. Oil from the seed is also used in cosmetics, particularly in moisturizers. ^ "Genus: Adansonia L." Germplasm Resources Information Network. United State Department of Agriculture. 12 November 2008. Archived from the original on 30 May 2010. Retrieved 14 January 2011. ^ Eggli, U.; Newton, L.E. (2004). Etymological Dictionary of Succulent Plant Names. Springer Berlin Heidelberg. p. 3. ISBN 978-3-540-00489-9. Retrieved 25 September 2018. ^ a b c Ed Yong (11 June 2018). "Trees That Have Lived for Millennia Are Suddenly Dying The oldest baobabs are collapsing, and there's only one likely explanation". The Atlantic. Retrieved 12 June 2018. ^ a b Rachel Nuwer (12 June 2018). "Last March of the 'Wooden Elephants': Africa's Ancient Baobabs Are Dying". New York Times. Retrieved 13 June 2018. ^ "Big Baobab Facts". Archived from the original on 6 January 2008. Retrieved 8 January 2008. ^ a b Patrut, A., et al. (2010). Fire history of a giant African baobab evinced by radiocarbon dating. Radiocarbon 52(2), 717-26. ^ a b c "Adansonia digitata (baobab)". Royal Botanic Gardens, Kew. Archived from the original on 20 February 2014. Retrieved 8 June 2014. ^ Wickens, G. E.; Lowe, P. (2008). The Baobabs: Pachycauls of Africa, Madagascar and Australia. Berlin, Germany; New York, NY: Springer Verlag. ISBN 978-1-4020-6430-2. OCLC 166358049. ^ a b Pettigrew, J. D.; et al. (2012). "Morphology, ploidy and molecular phylogenetics reveal a new diploid species from Africa in the baobab genus Adansonia (Malvaceae: Bombacoideae)" (PDF). Taxon. 61 (6): 1240–1250. doi:10.1002/tax.616006. ^ "GRIN Species Records of Adansonia". Germplasm Resources Information Network. United State Department of Agriculture. Archived from the original on 24 September 2015. Retrieved 14 January 2011. ^ Gardner, Simon; Sidisunthorn, Pindar; Lai, Ee May (2011). Heritage Trees of Penang. Penang: Areca Books. ISBN 978-9-675-71906-6. ^ "The Baobab tree in Senegal". Archived from the original on 4 October 2008. Retrieved 1 October 2008. ^ "Species text in The Atlas of Southern African Birds" (PDF). Retrieved 30 October 2014. ^ "Weavers breeding in baobabs". Animal Demography Unit, Department of Biological Sciences, University of Cape Town, South Africa. Retrieved 30 October 2014. ^ "Adansonia gregorii". Australian Tropical Rainforest Plants. Retrieved 8 June 2014. ^ a b c UK Advisory Committee on Novel Foods and Processes (July 2008). "Baobab dried fruit pulp. EC No. 72; August 2006: Application from PhytoTrade Africa to approve baobab dried fruit pulp as a novel food ingredient. Authorised July 2008". UK Food Standards Agency. Retrieved 3 June 2012. ^ "Baobab: Benefits, nutrition, dietary tips, and risks". Medical News Today. Retrieved 20 June 2018. ^ Osman, M. A. (2004). 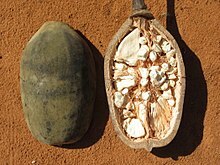 "Chemical and nutrient analysis of baobab (Adansonia digitata) fruit and seed protein solubility". Plant Foods Hum Nutr. 59 (1): 29–33. CiteSeerX 10.1.1.587.6400. doi:10.1007/s11130-004-0034-1. PMID 15675149. ^ Chadare, F. J.; et al. (2009). "Baobab food products: a review on their composition and nutritional value". Crit Rev Food Sci Nutr. 49 (3): 254–74. doi:10.1080/10408390701856330. PMID 19093269. ^ "South African villagers tap into trend for 'superfood' baobab". AFP. 24 September 2018. Retrieved 29 September 2018. ^ "Baobab dried fruit pulp". UK Food Standards Agency. 2008. Retrieved 3 June 2012. ^ "GRAS Notice No. GRN 273". US Food and Drug Administration. 25 July 2009. Retrieved 3 May 2018. ^ a b Ambrose-Oji, B. and N. Mughogho. 2007. Adansonia grandidieri Baill. Archived 7 April 2014 at the Wayback Machine In: van der Vossen, H. A. M. and G. S. Mkamilo (Eds). PROTA 14: Vegetable oils/Oléagineux. PROTA, Wageningen, Netherlands. ^ a b Ambrose-Oji, B. and N. Mughogho. 2007. Adansonia za Baill. Archived 2 April 2015 at the Wayback Machine In: van der Vossen, H. A. M. and G. S. (Eds). PROTA 14: Vegetable oils/Oléagineux. PROTA, Wageningen, Netherlands. ^ "Dance of the baob". The Australian Women's Weekly. National Library of Australia. 2 February 1966. p. 26. Retrieved 11 January 2012. ^ Vermaak, Ilze; Kamatou, Guy; Komane-Mofokeng, B.; Alvaro, Viljoen; Beckett, Katie (2011). "African seed oils of commercial importance — Cosmetic applications" (PDF). South African Journal of Botany. 77 (4): 920–933. doi:10.1016/j.sajb.2011.07.003. Retrieved 21 January 2019. Wikimedia Commons has media related to Adansonia. Wikisource has the text of the 1911 Encyclopædia Britannica article Baobab.